Since 2011, Hirschfeld’s barber chair and drawing table, on which he created virtually all of his legendary drawings, have stood at the entrance of the New York Public Library for the Performing Arts at Lincoln Center. You can go there day or night and see the chair and table and a rotating exhibition of full size vintage reproductions of Hirschfeld drawings. For anyone interested in the performing arts, the Library is a must-stop for research, reading or taking in their remarkable series of exhibitions (including a great Hirschfeld show in 2013). Now through the end of May, there will be a curated series of drawings on the table to coincide with the Library’s latest hit show, Shakespeare's Star Turn in America, a celebration of the enduring inspiration of William Shakespeare’s plays. 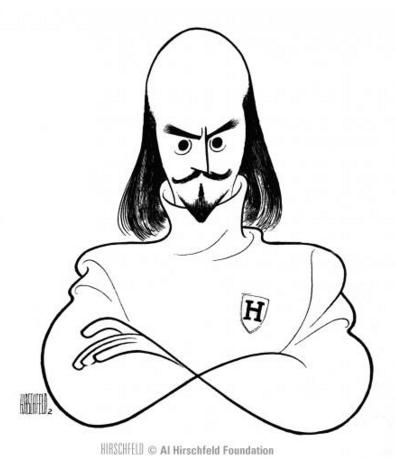 Every other week different Hirschfeld drawings of Shakespeare productions will appear on his drawing board covering many of the Bard’s plays, and featuring a wide range of performers including Al Pacino, Raul Julia, Morgan Freeman, Tracey Ullman, Christopher Walken, Alec Baldwin, and Angela Bassett. The first presents a unique view of a New York institution. Joe Papp had been producing Shakespeare since 1954, creating The New York Shakespeare Festival whose original aim was to make Shakespeare's works accessible to the public. In 1957, he was granted the use of the Turtle Pond in Central Park for free productions of Shakespeare's plays. By 1961 construction had began on the Delacorte Theatre in the park to present the performances. While that space was being built, and the Turtle Pond was being renovated, Papp used Wollman Rink to stage a summer season of Shakespeare. Hirschfeld visited a rehearsal of the Festival’s new production of Much Ado About Nothing in June 1961, and the Sunday before the show opened (in a performance cut short by a rainstorm), Hirschfeld’s drawing of the work-in-progress in graced the front page of the New York Times Drama section. Hirschfeld has been bringing readers backstage since the 1930s, and he would continue to do so throughout the remainder of the 1960s. He was such a frequent presence at rehearsals that he did not disturb the process, but captured it first in pencil and later in ink for posterity. Look to our Twitter and Facebook accounts to learn of the next drawing to be on view at the New York Public Library for the Performing Arts at Lincoln Center.